The supposedly hack-proof PS3 has been cracked by one of the original "jailbreakers" of Apple's iPhone. In this round of the console war, you could argue positives and negatives of the various systems with other fanboys until you were blue in the face, but Sony's PS3 had one decidedly huge advantage over the other systems: It was supposedly unhackable, rendering it effectively immune to piracy. Yes, that's why the Xbox 360, Wii, and PC all had "Most Pirated" Lists, but the PS3 did not. That may have changed in one fell swoop: US-based hacker George "Geohot" Hotz told the BBC that he had successfully cracked the PS3. The hack, which could enable people to run "homebrew" software or pirated games (including PS2 titles) on the Sony console, took Hotz a paltry five weeks to develop - hardly an eternity, considering that the console has been out for over three years at this point. "It's supposed to be unhackable - but nothing is unhackable," Hotz told the BBC. "I can now do whatever I want with the system. It's like I've got an awesome new power - I'm just not sure how to wield it." 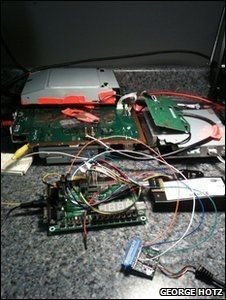 The hack is largely software-based, but does require hardware modifications - "5% hardware and 95% software," according to Hotz - meaning that any would-be PS3 pirates would need to invalidate the warranty on their console in addition to leaving a physical trace. Presumably, Sony would be able to pull off a Microsoft-esque mass banning of modded PS3s from its PSN service, so said pirates will be doing this at their own risk (if it goes public). That is, if it goes public - Sony can't be happy with the news, and is reportedly investigating the matter as you read this. Still, it's unknown what possible consequences Hotz is facing, as the young hacker first rose to prominence in 2007 after "jailbreaking" the Apple iPhone to make it compatible with any phone network and not just AT&T. If Apple couldn't get him, what can Sony do?